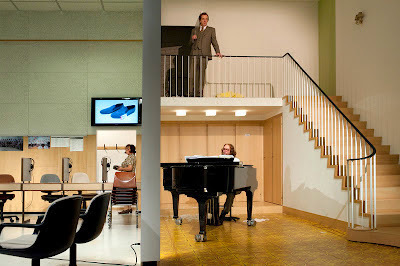 Swiss director Christoff Marthaler's Meine Faire Dame is very much a *version* of Lerner and Loewe's 1956 musical. By which I mean; take pretty much everything you know about My Fair Lady and throw it away. I think about three or four songs from the original survive into this staging, and they are mostly given pretty short shrift. Why Can't The English Speak English? is delivered as speech; I've Grown Accustomed To Her Face becomes three lines of drunken sprawl; I Could Have Danced All Night is sarcastically delivered as a rapid, fairground hammond organ jingle. Then there's the setting: a large, sixties-architecture language lab, with polystyrene ceiling tiles and cheap wooden and plasterboard walls. The performers don't really take *parts* as such; well, the cast's only British performer, Graham F Valentine, is pretty much "playing" Prof. Henry Higgins, although there's a curious note in the programme alleging that he's playing a Hungarian linguist called Professor Zoltán Karpathy. The rest of the cast as dressed as sixties language students, of various ages. Except second keyboardist Mihai Grioriu, who is dressed as Frankenstein's monster in a brown corduroy suit. Oh, and such recourse as there is to the “plot” of the original seems to be running backwards, so it starts with the “cured” Eliza (nominally represented, I think, by a young actress, an old actress and Frankenstein's monster - perhaps a comment on the “social experiment” of Shaw's Pygmalion) and ends with them meeting. Maybe. The “plot” isn't really the point. So what's there instead? Well, Marthaler has essentially assembled a kind of high- and low-cultural jukebox musical with contributions ranging from Dowland's Flow My Tears, Mozart's Magic Flute and Wagner's Lohengrin to Wham's Last Christmas, Bryan Adams' Everything I Do and Codo (Ich düse, düse im Sauseschritt) by German eighties popsters DÖF (not heard it? YouTube it now; it's great!). The singing, accompanied by piano and organ, is ridiculously beautiful. The gentle piano accompaniment and delicate vocal harmonies lend the proceedings a church-y kind of grace, which seems to suspend the eclectic and sometimes patently absurd music perpetually between the ironic and the sublime. It's also incredibly funny. There's a seam of visual comedy, clowning and absurdity which, coupled with the beautiful music, engenders something like that irrepressible desire to laugh at a funeral. And in a way, that is the key to what Marthaler has done here. By planting the idea that this is *about* My Fair Lady, we view proceedings from that standpoint, cross-referencing and wondering how various elements relate to this central theme; at the same time, there is a higher narrative arc made from linguistic misunderstandings and slapstick, that is all about love, thwarted romance and ultimately ageing. Indeed, by the time Friedrich Holländer's Wenn Ich Mir Was Wünschen Dürfte (made famous by Marlene Dietrich) turned up, I was feeling a bit choked, truth be told. This might not be a production for fanatical My Fair Lady purists, but judged on its own terms, this is an incredible, funny, touching and sometimes beautiful piece of theatre. TBH, given Edinburgh time-constraints, I'm starting to find short-form reviewing quite seductive. On the other hand, I loved Meine Faire Dame in such a personal way that I thought I'd at least stick up a bit of an appendix/track-list as a supplement here so you've got some of the songs I write about in my review and a link to the theatre-trailer, so if you're not going to get to see the show, you can at least have a multi-media stab at trying to imagine it for yourselves. There's also a three minute video trailer, including snippets of the versions of some of the above and more here.